We’re tidying up the Cenacle archives at the moment and coming across all sorts of things. We thought we’d share some of our treasures periodically. 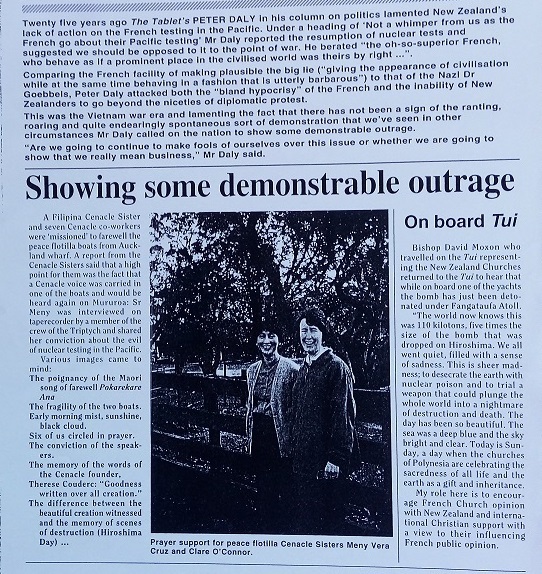 For instance, here’s an article from The New Zealand Tablet in August 1995 of Sisters Meny Vera Cruz and our very own Clare O’Connor, farewelling the peace flotilla in Auckland, bound for Mururoa, protesting the continued French testing in the Pacific.